JULIA Gillard has opened raw wounds in the Labor Party by declaring that she compounded the mistake of appointing Kevin Rudd as foreign minister by replacing him in the role with former NSW premier Bob Carr. These are among a number of crucial errors she professes to have made as prime minister after toppling Mr Rudd in 2010. She has told veteran interviewer Ray Martin that she had no choice but to give Mr Rudd the consolation prize of foreign minister when Labor’s 2010 re-election campaign was destabilised by internal leaks, blamed on the former prime minister or his supporters. The interview, to be aired tomorrow night by the Nine Network, has the potential to revive the bitterness that consumed the ALP in government under Ms Gillard until she finally lost the leadership to Mr Rudd on his second challenge in June last year. Ms Gillard insists she would have “out-campaigned” Tony Abbott had she lasted as prime minister, but she does not claim that Labor would have won last year’s September 7 election. Mr Rudd quit as foreign minister when he launched his first, unsuccessful bid to reclaim the top job in February 2012 and was succeeded by Mr Carr, who had been approached by Ms Gillard to come out of political retirement and enter the Senate through a casual vacancy. Ms Gillard cites as another error her attempt to put Labor’s floundering 2010 campaign back on track by declaring that she would place the “real Julia’’ front and centre. This happened five days before she met Mr Rudd to reach the grudging accommodation that led to him becoming foreign minister. “She puts her hand up to a lot of mistakes,’’ Martin says. Until now, Ms Gillard has refused to give her account of the night she went after Mr Rudd’s job on June 23, 2010. However, he broke his silence to The Australian’seditor-at-large, Paul Kelly, for his well-received book on the saga of the Rudd-Gillard-Rudd governments, Triumph and Demise, published last month. In an extract from the Martin interview transcript, released by Nine to News Corp Australia Sunday newspapers, Ms Gillard admits to wrongly giving Mr Rudd the impression he could have survived as PM in 2010, something she still had a “sense of self-recrimination over’’. Mr Rudd was approached for comment last night, but was not available. Mr Carr could not be contacted. He resigned from the Senate in October last year, despite winning his spot at the election won by the Coalition under Mr Abbott. Martin said Ms Gillard also offers warm insight into her relationship with her partner, Tim Mathieson. “Tim kept not just her feet on the ground, but gave her that sense of normal when she would come home and have a bath or a glass of wine … he was more than her rock … he was a comfort zone in the midst of being beaten up by Abbott and Rudd and the Canberra press gallery,’’ Martin said. Reader comments on this site are moderated before publication to promote lively and civil debate. We encourage your comments but submitting one does not guarantee publication. We publish hundreds of comments daily, and if a comment is rejected it is likely because it does not meet with our comment guidelines, which you can read here. No correspondence will be entered into if a comment is declined. After all this, Gillard cannot say "Sorry" to the Australian public who suffered and will continue to suffer, from the ramifications of her incompetence. I agree with JG, the appointment of Carr as foreign minister was a big mistake. But what the hell, Rudd and Carr were both disasters by any measure. Mr Carr especially irked me with his anti Israeli policies and in rolling JG on this question. But does this really deserve reporting in a serious newspaper. Mr Martin and Ms Gillard are no longer relevant to national debate. With a bit of luck the Abbott Government will generate enough respect and competence to rescue the nation from the abyss presented by Labor and the Greens. Surely after Ms Milne's apologies for Islamic terrorists the nation can see that the Greens are anathema to democratic rule in Australia. Hey who's the biggest has been? Ray or Julia? @Andrew well said, right on, its just like the Midday Show all over again. @Andrew Never was, more like, in both cases. Can we just forget her? And here I was thinking she would fade into the sunset and live of her parliamentary pension, but more importantly not inflict herself on us.........wrong again clearly she is of the belief that she was better than we all know. What did you do to benefit Australian taxpayers? What happened to the budget surpluses? Why did you take Industrial Relations back to WW2? Why did you stack "Fair Work" with pseudo-legal union hacks? Why did you promote your former associate (who also left G&G under a cloud) to the high court? Didn't channel 9 monitor how many viewers switched channels the moment Julia appeared on screen while in government, why would they think this would be any different. Nothing could make me sit through an interview with Julia. Gillard was the biggest mistake inflicted on Australia . if you werent with her she was against you = not a PM for 'all people'. 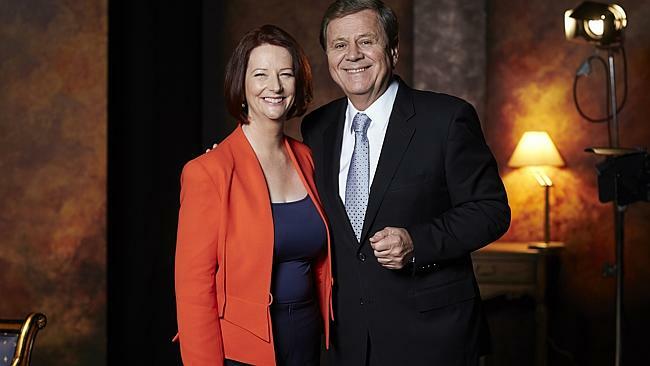 I wont be watching and therefore encouraging the likes of channel 9 and ray Martin to pay Gillard to launch her book. If i was interested in fantasy i would watch the sci-fi channel. Rather read about it all on the Australian tomorrow. Much better for the blood pressure. She did such a great job out-campaigning Tony Abbott in the 2010 election, Labor lost their majority with the Liberal Party actually winning more seats. While she was PM there were Labor wipeouts in Queensland and NSW and all the polls pointed to Federal Labor sharing the same fate. She is completely delusional if she thinks she could have saved the furniture and it was obvious to the majority of her colleagues that the damage had been done and no amount of Gillard campaigning would have made any difference. In fact most public opinion showed that Australians were completely sick of seeing and hearing her and had she been PM through the election this would have made matters worse. After 6 years of Labor shambles is very refreshing to have a government not totally absorbed in themselves and getting on with governing. if by campaigning julia means talking - yes- she can talk but who wanted to listen any more. When did she realise she had made a mistake about Carr, and what did she do about it? In fact with all these things she now thinks was a mistake, what did she ever do to correct one? Can we have a list of mistakes, and their costs , drawn up, and published. Make a good last chapter for her book? If Julia thinks being asked by a member of the Canberra press gallery " what can we do to help " is getting beaten up, she's still young and naive. she wasnt too shy to tell them to stop writing crap when she didnt like what they wrote. I'm no fan of the ALP but I thought Bob Carr was one of the few relatively successful ministers in the recent and unlamented government, and far more realistic and "diplomatic" than Kevin Rudd who delighted in meddling where it was not warranted, lecturing others about their perceived shortcomings and having periodic tantrums when he didn't get his own way. Rudd may have worked hard in comparison to Carr, I wouldn't know, but it was to very little effect; in any case, Julia Gillard is not someone I would readily believe without strong corroborative evidence. @Leslie Could you tell me how many days Carr actually took his seat in the Senate? Not many, if any. Julia is a pet hate but Bob was not voted into office and when he finally achieved that after many jaunts around the world he quit! He was lazy. Gillard was right. @charles Ministers of state often absent themselves from the legislature due to engagements and other official commitments, especially the Foreign Minister who, of necessity, spends a great deal of time overseas, struggling with the rigours of business class travel and less favoured five star hotels. Carr wasn't voted into office as a senator but that is the way the constitution works, he filled a casual vacancy so there is very little to be said about that as an issue. Many people seem to believe that K Rudd had a stellar career as a diplomat before entering parliament:he didn't. His performance as PM and Foreign Minister was always compromised by his character flaws which were many and major; he wasn't lazy, quite the opposite but his manic drive mostly alienated people at all levels and defeated his purposes which were many. When she was asked about ther present occupation , did she say pensioner!! Oh No, she rattled off three positions, just imagine how much money this poor afflicted woman is getting, why isn't her pension reduced like mine if I earn too much. Gillard beaten up. The comment itself is offensive to anyone with common sense. She is still driving the divisive gender card to the end and she like the jihadists should not be given a natioal platform to spread their misleading and untrue commentary. one of the things that really irritated me was that julia gillard assigned to herself the role of spokesperson for all women. she never really did anything but use women, the disabled, promising the world but delivering nothing, and forever using our kids .. the photo ops were nauseating. i agree Noel!julia gillard has never won an election. @Barbara @Noel I had trouble editing my post while you replied. Essentially it's the same post as above. (Had to repost). you précised it for me Noel. i was writing the same thing! but i'll add to it if i may ... julia was put in the job by the unions and she stayed there because of her much lauded negotiating skills with the greens and the "independents". but remember the hysteria when gillard go it? nothing about policy - it was all about being the first female pm. well julia proved she was no golda meir; no angela merkel, maggie thatcher, indira ghandi, benezir bhutto or aung sang suu kyi. she has more than enough of our money to live on now - so julia, please just go away. absence may make the heart grow fonder? @Barbara @Noel absence may make the heart grow fonder? no, never. We should never forget what this person, the unions and the ALP did to our Nation. @Barbara @Noel Lol looks like my post is lost but you've pretty much highlighted my points. Well she admits she was wrong,thats a first.J.L made that many mistakes in her short stay at the top perhaps she should now keep a low profile and enjoy her tax payer funded perks. it was a bit of a claytons admission - gillard still thinks she should be in the PMs office - if Carr hadnt been a dud ... if wayne had a clue about anything, if Kev wasnt a so-and-so, that everyone should hate tony abbott as much as she does .... if the stupid voters had only voted her in .... then everything would be as it Should be - according to julia gillard. Quote "beaten up by Abbott and Rudd and the Canberra press gallery". OMG - never has a PM had a more cushioned ride from the Canberra press gallery; never has a PM been less taken to task for failings; never has a PM been so praised for doing so little. Julia Gillard's memory seems to be working just fine when it comes to justifying her existence and spinning her "legacy" - pity her memory isn't so good when it comes down to who paid for the renovations of her home or certain missing documents involving the creation of a fraudulent entity the purpose of which was corrupt. julia's going to the US next month to talk about herself. oh god! i wish someone could set the record straight over there about the damage she and her predecessor/successor, kevin rudd, did to our country - and how reviled they were - and how it seems the majority havent forgiven or forgotten them. @Barbara @Right! said Fred I question whether the US is big enough to accommodate the two worst ever PMs to ever be inflicted on Australia. Might I suggest a coup of biblical proportions for a live interview on the David Letterman show during their stay. The clash of egos would be stupendous viewing, add Bob Carr and it would be a full house. its just so embarrasing! i hope julie bishop gets some airtime so they dont get their only impressions of australian politicians from r/g/r. @Barbara @Right! said Fred I trust the Americans will love the voice. Hope they realise we don't all speak like that. Share a bit of sympathy for me. I have to live in the same city as she is now! @Robert We hear your pain, Robert! @arlys @Robert Thank you arlys. Gillard compounded the mistake by being Gillard! But where were the wise men and women MP's that allowed it to happen? And it seems the interview will once more impact on our memories of division, rancour and dysfunction that hallmarks the Labor party. Which particular "real Julia" Gillard are you referring to? I don't think any came anywhere near Angela Merkel for leadership quality. Agree with the last sentence completely. @Mouse @M M @Jim-Cherna She was just all hyperbowl! seems it was the unions JC, not the other politicians who made the decisions. No fan Of Gillard, certainly no fan of Rudd but no fan of the current PM either -- Knighthoods... seriously is he having a joke on the nation??? Fiscal Conservative???? well the Paid Parental scheme says it all... Kevin Andrews, Pyne, Brandis and Hockey have performed poorly. Please step up, the next generation of leaders on both sides of politics. We are surely at the bottom of the talent curve at present. @Ian I am yet to hear you complain of Leigh Sales of the ABC getting her full PPL. But the girl who does her makeup is not entitled to it. I thought the left values are, everyone is equal? @Ian if 'knighthoods' is front and centre being the worst you can come up with for Abbott we're in good shape. Now here is the challenge, Ian: come up with one achievement from the 6 year dysfunctional tenure by Labor that did good for our great Nation without getting us into debt, was fully funded, did not require borrowings, did not do harm to some, did not create farce or draw criticism, did not end up in sleaze, and was not overprice... Bet you can't come up with so much as ONE thing! My wife has the correct angle on the PPL she asks why is it that Tanya and the rest of the Labor staff, and all the public servants get a full PPL whilst she has to get by on a basic wage for a shorter time; she goes on to say that its unfair making her feel inferior to the taxpayer (that includes her as well) funded public servants... I digress, back to the challenge Ian. Did you read my post? Did I say I was a fan of Gillard, Rudd? No... it is not that hard. The comment was about the poor state of politics that has sunk to a low ebb and the current government/leader are very ordinary indeed. @Ian @DES @Jim-Cherna Still didn't answer Jim-Cherna's question. @Ian Er Ian, the knighthoods and Dames as the top level of the Order of Australia was a Gough Whitlamism. Good Labor policy. I am surprised that someone who describes himself as Liberal 2 or Centre Right (which I think is stretching the truth somewhat) supports Labor's 2 class system. Public servants and ABC get an exceedingly generous PPL, funded by those who actually work for a living but have no such entitlement. Well are knighthoods and Dames Labor policy now..or in fact that of the majority of the Liberal Party room?? And Brian I suspect my economics may be to the right of you as a lover of neo liberalism and globalization. Don't worry Brian I suspect those socialists in Europe would embrace the PPL- you will find a sympathetic ear there. Ian, this is a gentle reminder to answer Jim-Cherma's question. @Irene WHY DO I NEED to answer Jim's question? It's simply irrelevant because I was NOT making a case for Rudd or Gillard. I believe they were a dysfunctional government . If you want one achievement - how about the apology made by Rudd to the stolen generation? Does that satisfy you?. What is this? You're upset because I criticized both sides of the political spectrum? Seriously.. is this a game? @Ian @Irene Hi Ian. Most of us realize that Rudd's apology was "Look at Me" grandstanding and not really genuine and what did it achieve anyhow! @Ian @Irene Irene, the apology did nothing - it was merely symbolic.Ask any Aborigine. Like everything the Dudd did, it was all for show. Compare that with the current PM who goes out and gets his hands dirty, so he can understand our first people's problems. @Christopher Hi Christopher. Ian also conveniently forgets that we are not yet a Republic and Queen Elizabeth is still our Head of State and not to forget our British heritage, which most of us are proud of, which the left finds cringe worthy! @Ian Ian, you must be a lefty fan to praise former PMs Gillard and the Dudd. The current PM, Abbott, is doing a marvellous job. He does not rant and rave, he is not a media tart, has done a wonderful job o/s - look at how they are praising him overseas. I really do feel we have adults in charge now. Everything he does is considered. I also like the character of PM Abbott - notice his cycling mates are old mates, not new ones he has to find - shows the character of the man, along with a lifetime dedicated to charitable work. PM Abbott has such a mess to fix. You blame Howard, but he handed Labor no debt so your Howard rant is just that, a rant. Costello said we had a "tsunami" coming and everyone laughed. You only need to look at NZ, who was hit more than Australia. They let the recession wash over them during the GFC and are in a marvellous position now. I remember thinking what PM Keys was doing - no stimulus - and said it would be a test as to who was right. Unfortunately the left cannot see how good the current govt is. People are saying the Coalition are for big earners, as he took thinks off the lower socio economic people. Trouble is if people on low wages worked harder, like top earners, they would be a lot better off. The govt has nothing to take from higher earners as they receive no handouts. Carr re Daniella Weiss and LYONS! !